Debbie Stothard is an active promoter of human rights in Burma and the ASEAN region. During her 32-year career, she has worked as a journalist, community education consultant, governmental advisor, and trainer in Malaysia, Australia, and Thailand. 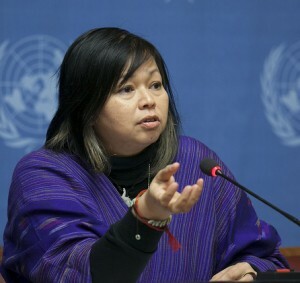 In 1996, she founded the Alternative ASEAN Network on Burma (ALTSEAN-Burma) and was elected Secretary-General of the International Federation for Human Rights (FIDH) in 2013. Ms. Stothard has served as an instructor at multiple Global Raphael Lemkin Seminars, including the most recent in November of 2015. Abandoning non-interference and sovereignty policies. Many states have used these policies as an excuse not to monitor situations or intervene diplomatically at the earliest stages of vulnerability. In the ASEAN region, states have clung to the principle of non-interference to the point of irresponsibility. Sovereignty is quite an important principle in international affairs. It’s one of the principles that is commonly referenced. But some states, more than others, have a better understanding that, when it comes to mass atrocities, you cannot use the principle of sovereignty and non-interference as an excuse not to act. When you talk about action, you’re talking about preventive action, not military intervention. These cases are not events that have occurred overnight. For example, in the Arakan/Rakhine State of Burma, we’ve been aware of the situation almost from the very beginning, just from by being involved in the Burma movement from 1988. We spoke about this. We tried to address it in how we did our activism, trying to be more inclusive. In the end, it was not a question of if, it became a question of when. I think that many of these situations don’t happen overnight. Many governments and many people are aware that there are vulnerabilities in these situations. It is outrageous that many states don’t have a great sense of urgency when these cases are raised. Sometimes it’s because of economic interest – access to natural resources, sometimes it’s because of political reasons – because the regime concerned is a strategic ally. Sometimes it’s due to just being a little bit too complacent. In ASEAN itself, states need to be willing to update and amend the principle of non-interference. When it comes to business and economic engagement, there is a lot of selective interference. What lessons could the world take from prevention efforts in ASEAN/Burma? We’re living in a world where the doctor who saves a patient from an illness is lauded, but the public health worker who prevents illness is not. I think in the case of mass atrocities, people more often notice those who are able to save lives during atrocities than those who were able to prevent or mitigate those atrocities from the outset. I think we do need to acknowledge, and do more to support, the work of people in prevention. When it comes to mass atrocities, the long-term economic and human security impacts are so serious and so wide ranging that it’s actually against the security and economic interest of the world to let mass atrocities happen. I think we need to acknowledge that and take this matter with much more urgency. However, there is a danger, sometimes, in engagement for engagement’s sake, especially when it is treated as an achievement. We need to have a deeper and more strategic analysis on this. We cannot simply have engagement for engagement’s sake. It must be engagement for an outcome. When it comes to the prevention of mass atrocities and atrocity crimes, we can’t forget the community that is in danger. They have to come first. The community that’s in danger is not only the community that’s targeted in the atrocity, but also the perpetrator community. They are also in danger. They are in danger of condemning the innocents in their community to being tarred by the same brush. The kind of burden that this creates is immense, too. When one provokes or participates in an atrocity, he or she is not only condemning the victims and survivors to immense pain and suffering, but also condemning their own children, their own family members, who will be seen as part of a perpetrator community. I think what is interesting, at this point, is that people are starting to understand that nationalistic and racist rhetoric and hate speech have to be addressed, as they are part of the starting point. They sow the seeds for potentially very serious human rights violations. In the late 1980s, I was in a group of student activists from different countries working together across university campuses in Sydney, Australia. Whenever there was an incident or confrontation in a country in the region, we would immediately look for students from that country to pull together a quick response, whether it was a protest, public meeting, or media intervention. We would use that opportunity to learn more about that situation and encourage students to organize themselves and to call us when needed. We were something of a “activist SWAT response” – to go in and raise these issues across our campuses and in public. Eventually, some of us became specialists in specific country situations because we became the liaison point for, and spent so much time with, a cause. That’s how I became involved. I became the Burma specialist. Our East Timor specialist was Kamal Bamadhaj. Kamal went to East Timor in anticipation of a Portuguese peace mission, which was cancelled when José Ramos Horta (who later went on to become a Nobel Peace Laureate and President of East Timor) was set to join the delegation. Indonesia, who was occupying East Timor at the time, refused to accept that, and the mission was cancelled. Kamal, who was not even 21 years of age, stayed on for a few days more, despite cancellation of the peace mission, and as a result, was in East Timor during the Dili Massacre. He was shot and killed by an Indonesian soldier who was trying to grab his camera as Kamal documented the attack on Timorese civilians. Many of us, at the time, were still quite young. We had done a lot of solidarity work with causes in which young people had been killed, but I don’t think that any of us could have ever thought or ever imagined that one of our colleagues would be the victim of a mass atrocity or human rights violation. I think that it affected us all very, very deeply and made us understand that working in human rights would not be just a youthful phase in our lives. For many of us, it became a life commitment. When you’re in your late teens or early twenties, it’s quite a defining experience, having to write the obituary of your friend as a press release and having to read it over the radio. And then having to do all of the media, talking on tv, talking not just about your friend who has been killed, but also about all of the other people, the East Timorese who had been killed in the massacre. So, many of us, who were part of that group in 1991, are still working in human rights in our various capacities. It was quite an important turning point for all of us. The work that we’re doing on Burma has been mainly with religious and ethnic minorities. We’ve found that when it comes to human rights, democracy, and social justice, it’s always important to work with women, to strengthen the agency and political leadership of women, especially when it comes to peace-building and conflict prevention. One of the things that has been immensely fulfilling and rewarding is the work that we’ve done with these women, specifically with younger women from Burma coming from different ethnic backgrounds. When we work with vulnerable communities, we usually focus on women and the youth. Having done this work for twenty years, it has been amazing to see that the women are the ones, during this time of vulnerability in Burma, that have been the most active and the most effective advocates for peace. When we are talking about work in atrocity prevention, a significant part of that work is social transformation and supporting the empowerment of women, particularly those in vulnerable communities. When we deliver workshops and training events, we’re quite insistent that the participants should be 50% women. In the workshops and trainings that we have delivered in Burma and elsewhere, the female participation rate remains around 60%. This has been great, though it is never enough. For everything that we are doing, there are irresponsible forces at work which are attempting to use hate speech and ultra-nationalism as a tool to gain political control and political popularity, to gain votes and legitimacy. Whether it’s in Burma, the USA, Malaysia, or Syria, this is still happening. Is there anything else you would like to share about working in prevention? I think what is really important is, despite the seriousness and danger of these situations, we still have to have a very positive and encouraging approach. What I’ve seen is that, decision-makers in even the most powerful of countries, sometimes disempower themselves. They sometimes think that the situation is too overwhelming or too depressing to deal with. Most diplomats and decision-makers that I speak to, especially after an atrocity has already happened, begin to acknowledge that this is indeed serious. But I think that the urgency of action and the urgency of prevention are often overwhelmed by a feeling of “This is too big. It’s too late.” This is where we need to inspire and encourage decision-makers to understand that we all have the power to mitigate this and to prevent this from recurring. I think that, as workers in conflict prevention, we need to find the inner resources to be assertive and encouraging. Solutions are possible at every stage of the situation, but often they are the most cost-effective and the most feasible at the prevention level. We need to have the spirit and the guts to commit more to prevention. Working on cases of mass atrocity is very depressing and can be soul destroying. It has the potential to endanger us, ourselves, as people can suffer from secondary trauma. We need to have tools to protect ourselves from that trauma in order to prevent future trauma to others. I think this is quite important. Equally important is the realization that I don’t live in this situation of vulnerability – my students and colleagues do, every single day. That’s a good motivation to find the inner resources to keep on going.